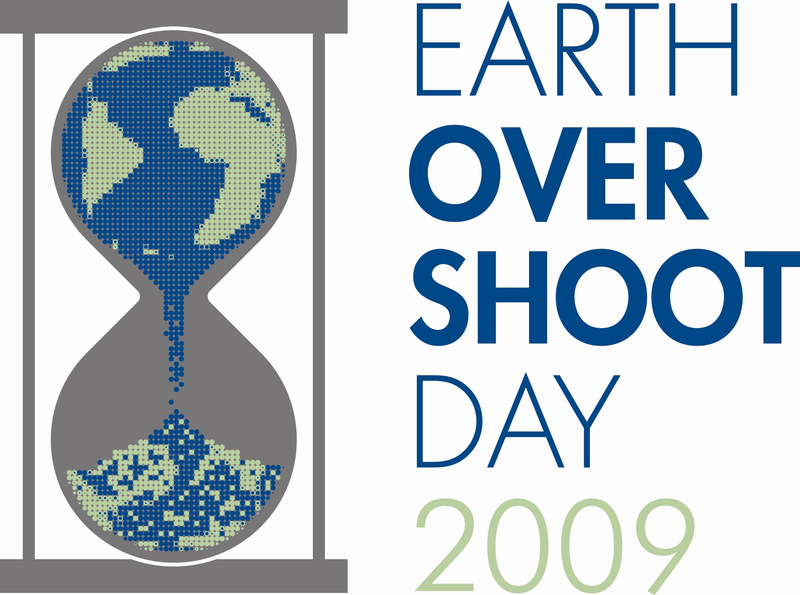 Today is Earth Overshoot Day. This is not a day to celebrate. Calculated by the Global Footprint Network, Earth Overshoot Day shows the day on which our total Ecological Footprint (measured in global hectares) is equal to the biocapacity (also measured in global hectares) that nature can regenerate in that year. For the rest of the year, we are accumulating debt by depleting our natural capital and letting waste accumulate. The ratio shows that in 2009, in just 268 days (September 25), we demanded the biosphere’s entire capacity for the year. I like these images from GFN. This first one, “Running on Empty” uses the familiar speedometer, we are clearly in the red. But perhaps, I thought, that’s not too bad – only 40% too much – surely we can do that? But then you look at the next one, showing the relative dates of different countries and you realise that we really are in trouble. With America living in ecological debt from the 21st of March and much of the world aspiring to the American dream, the future looks grim. I’m reading about solution focussed counselling and motivational interviewing at the moment so I’m grasping for positives here. I misinterpreted the country diagram for a bit – the UK seemed only 57% too high but alas at 257% it is 157% too high. The Living Planet Report presents scenarios based on this same information (and the detail upon which it is based). Here, the GFN, WWF and the Zoological Society of London discuss the strategies that could reduce the gap between human demand on nature and the availability of ecological capacity. Each of these strategies can be represented as a sustainability wedge that shifts the business-as-usual path towards one in which, when these wedges are combined, overshoot is eliminated. One way of organizing wedges is to link them to the three factors that determine footprint. Some strategies in the per person consumption and technology wedges, such as insulating buildings, produce quick results for shrinking overshoot. 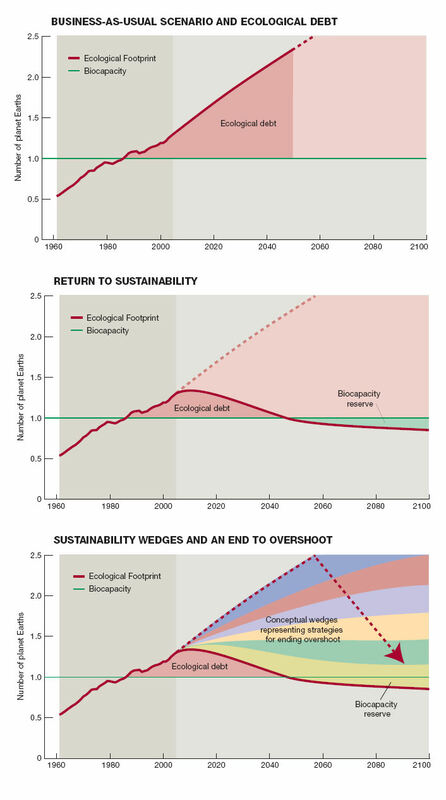 Other strategies, such as those that would reduce and eventually reverse population growth, may have less impact in the short term, but lead to large cumulative declines in overshoot in the longer term. Within a wedge, many interventions are possible. Individual consumption can be reduced by designing cities in which walking is preferable to driving. Technological innovations can increase the efficiency of resource use, such as meeting communication needs with cellular phones rather than landlines. Rehabilitation of degraded lands can increase agricultural yields while minimizing increases in footprint associated with agricultural expansion. Alternatively, wedges can also be organized around major consumption categories such as food, shelter, mobility, goods and services, along with population size. The footprint of food, for example, might be reduced by optimizing the relationship between the distance it is transported and the efficiency with which it can be locally produced. The energy efficiency of residential and commercial buildings can often be dramatically increased, and utilities supporting them can be integrated so that wastes from one system serve as inputs for another. Individual wedges typically overlap, creating opportunities for synergistic solutions that can bring about even greater reductions in overshoot. This is very useful. I appreciate all the thought and work behind this very useful presentation. I found it very interesting … working on a paper on ecological footprint.Thank you all.